Birney Quick, an instructor at the Minneapolis School of Art, opens The Outdoor School of Painting at Grand Marais for an eight week summer session. Citing the difficulties of transporting students to Grand Marais and housing them during the summer, Minneapolis School of Art moves the summer session to Red Wing. The city of Grand Marais writes MSA and asks them to come back to Grand Marais. The summer art school reopens in Grand Marais, using the top floor of old City Hall. The program is renamed the Town Hall Art Colony. Bryon Bradley begins teaching at GMAC, the birth of a long lasting partnership between the two co-founders. The longest-lived art colony in the state of Minnesota, the Grand Marais Art Colony began in 1947 as a summer refuge for artists seeking to study in an inspiring natural setting. 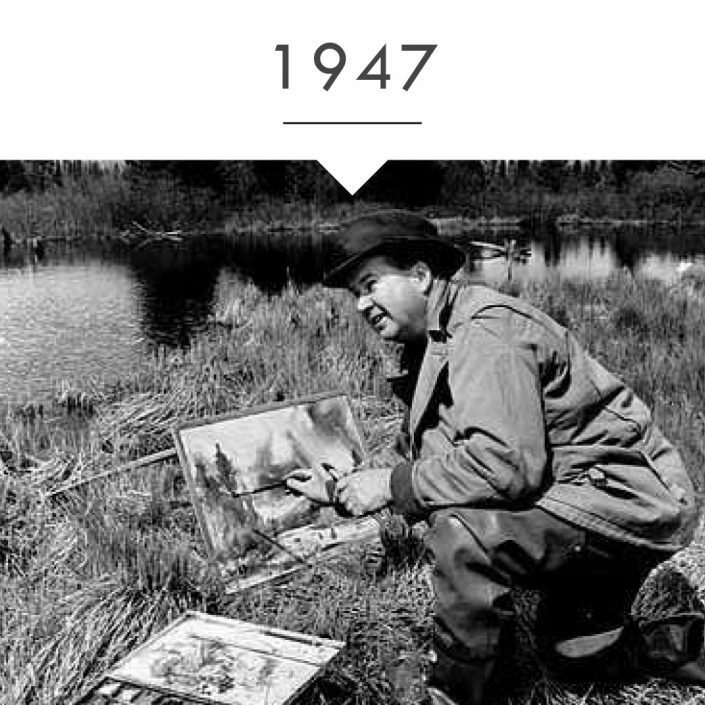 Birney Quick, one of the region’s acclaimed artists and a faculty member from the Minneapolis School of Art (MSA, now know as the Minneapolis College of Art and Design), came to this remote town of Grand Marais, to create the Outdoor School of Painting as a summer program of MSA. In 1954 Byron Bradley started teaching at the Art Colony. Byron Bradley was also an artist and professor at MSA as well as owner and operator of KB Art Gallery (one of the first galleries in Minnesota) and then of KB Art Materials (the best art supply resource in Minnesota). With the decline of student registration on the GI Bill, MCAD shifted their focus to on-campus activities. 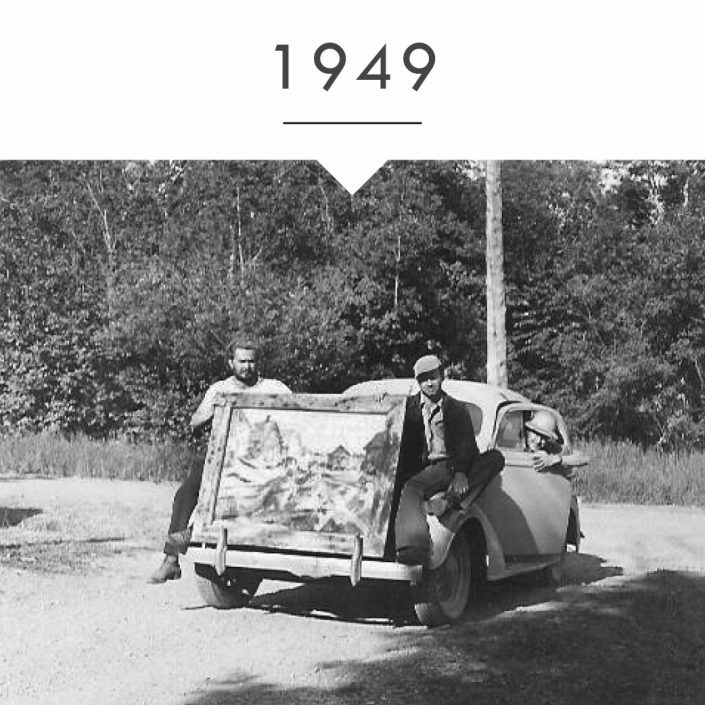 So in 1959, Birney and Byron took over the leadership of the Art Colony, firmly establishing themselves and the Art Colony in Grand Marais. They operated the Art Colony independently as a private business with the same collegiate criteria for creative excellence. In 1963 the Art Colony acquired the historic St. John’s Catholic Church (built in 1916) and has been located in the heart of Grand Marais ever since. 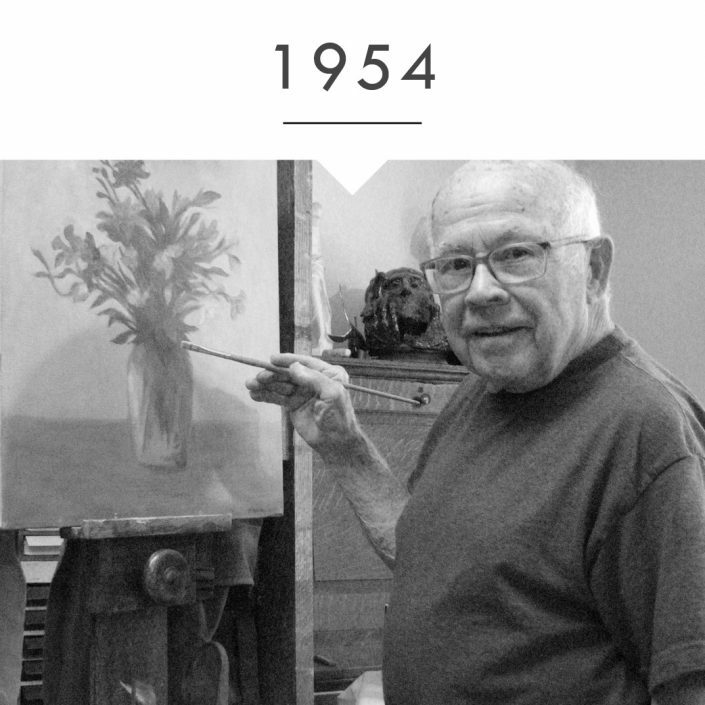 In 1966 Birney and Byron asked Harvey Turner (past participant) to join them as a youth instructor, and Harvey taught the Saturday morning youth art classes for many years. Until the 1980s, this trio, along with Keith Havens, made up the Art Colony’s artistic leadership. During Birney and Bryon’s tenure, many of Minnesota’s most influential artists and performers came to this remote artistic enclave to teach, perform, and create artwork, including George Morrison, Howard Sivertson, Frank Gillis, Doc Evans, the Minnesota Ballet, among many others. These artists also nurtured many college students who made their home on the North Shore and continue the legacy of the Art Colony today such as Betsy Bowen, Sharon Frykman, Dave Gilsvik, and so many more. Many fondly recall the Monday Night Fish Fries where Birney and Bryon grilled up freshly caught fish served with homemade sides and desserts paired with painting demonstrations, lectures, concerts, and dances long into the night. Birney passed in 1981 but not before inviting Hazel Belvo to teach in the summer of 1981. Without knowing it, he ushered in the next era of the Art Colony’s artistic leadership. Hazel is an acclaimed painter, feminist art advocate, co-founder of the Women’s Art Registry of Minnesota (WARM), and mentor. In addition to teaching over three decades at the Art Colony, Hazel has taught at Rhode Island School of Design, St. Paul Academy, and was the Dean of Fine Arts at MCAD. After Birney’s death, Byron maintained the Art Colony until the Cook County Regional Development Commission and members from the community established it as a community-supported, 501(c) 3 arts organization, legally called Grand Marais Arts, Inc. In the 1990s, the Art Colony installed a furnace, enabling the school to offer year-round art classes. 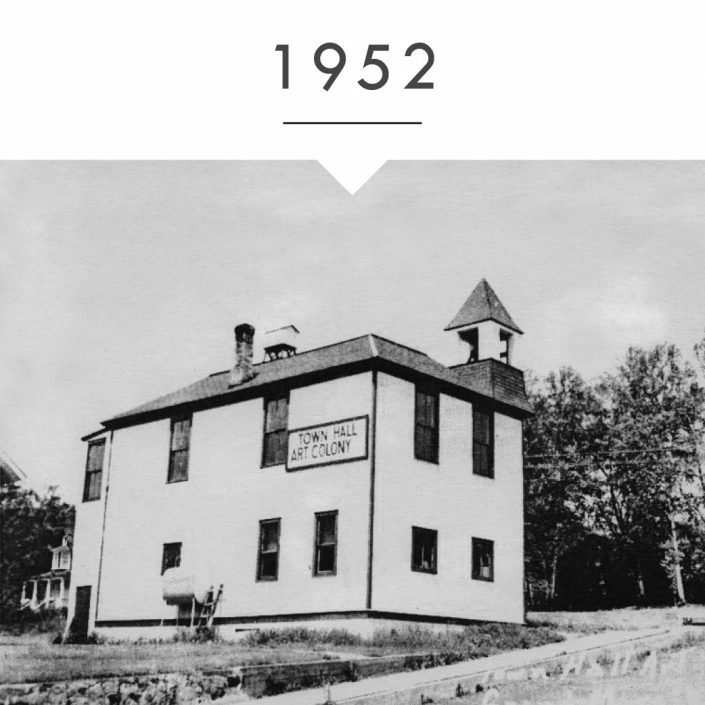 Also in the 90s, the Art Colony partnered with the Grand Marais Playhouse, the North Shore Music Association, and the Independent School District # 166 to establish the Arrowhead Center for the Arts, a $3.5 million auditorium expansion at the school. In 2005, GMAC doubled its existing studio space through the construction of a Studio Building that is connected by walkway to the original structure. The Studio Building provides studios for glass, pottery, and printmaking, as well as a Gallery Store and administrative space. The Historic Building houses the multi-discipline/painting studio, and an art library. In 2016-2017 a major renovation was conducted on the Historic Building to repair structural issues and address energy efficiencies. 2017 marks GMAC’s 70th anniversary and the legacy of sustaining an artistic home on the North Shore continues. Currently GMAC serves over 25,000 people and whether you are a novice, an art appreciator, or a professional artist, we invite you to find your place with us. Read an article about the Art Colony by the Minnesota Historical Society here or listen to a radio program about our historic facilities here.